If you own a business, the thought of having to move to a different premises might sound like a complicated process. After all, you’re going to want to transport valuable equipment and office supplies without breaking or damaging anything and move at a time that causes the least disruption to your business. Here at Metropolitan Movers East York Toronto, we’ve made that possible. We specialize in moves of all sizes and will be able to help you relocate to a brand new building without disrupting the working day. 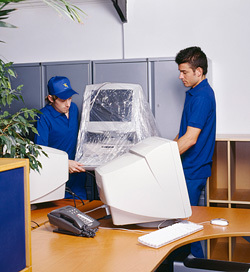 If you have computer equipment and servers, you need a moving company that you can trust. We will ensure that all valuable equipment is moved in a safe and secure manner, and we can even help you to unload once we get to the other end. You might be moving to another location or just to a different department in the same building. Wherever you are going, we will work around your schedule (not the other way around) and deliver a top-class service at all times. No two moving jobs are the same. That’s why we tailor our services based on the needs of your company. You might want to move outside of working hours to prevent disrupting your workforce. That’s no problem for us. We can arrange to move your belongings during the weekend or in the evening so you can get back to work as quickly as possible! Using the latest equipment and technology, we can ensure the business moving service process runs as smoothly as possible. If you’re searching for an business moving service in New York that you can count on, contact our staff today to find out about our moving services in Toronto. Arrange an appointment, obtain a quote, or just discover more about what we do. We look forward to hearing from you!